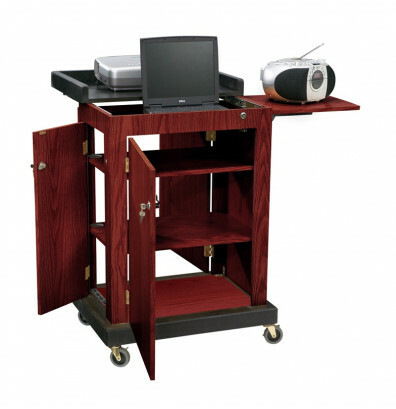 Oklahoma Sound SCLS Smart Cart lectern is a speaking platform and AV presentation cart. Includes a 25-watt amp, handheld microphone, and clip-on microphone. Mahogany finish. Dimensions: 28" W x 21" D x 41" H.
Oklahoma Sound SCLS Smart Cart lectern with microphone offers a presentation space with sound for enhanced public speaking. Features three adjustable shelves secure within three lockable doors for easy access. A retractable slide-out locking shelf provides extra space for a laptop or other equipment. The reading surface can also slide away to reveal a 2" deep storage compartment. Ships ready to assemble. The Smart Cart lectern with sound offers a 25-watt amp with an MP3-compatible 1/8" input jack and compatibility with OS wireless microphones. Full range 8" speaker is suited for normal classroom sizes. Built-in power strip and rechargeable battery for electrical access. Comes complete with a handheld mic with 9' cable, tie-clip/lapel mic with 10' cable, and a gooseneck mic arm. This presentation lectern and cart comes in a mahogany finish.